In this article, we’re going to look at great ways to make your drum set quiet. We discuss common muffling techniques, as well as turning your kit into a practice drum set using low volume cymbals and silent drum heads. Keeping your acoustic drum set to a reasonable volume can be a big struggle. Other musicians, like guitarists or keyboard players, have many ways to quiet down their instruments and practice all day long. Drummers usually don’t have that kind of luxury, to play whenever they want. The reason is simple, they are too loud. 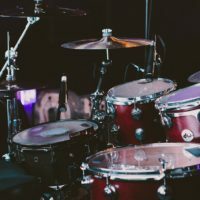 Whether you’re living in an apartment or in a house with your family, playing drums is pretty much mission impossible unless you’re lucky enough to have a sound-proofed room. There are various techniques to muffle a drum set. However, they can often reduce the experience and feel of the kit. In past few decades, drum enthusiasts tried to deal with this issue in many ways. 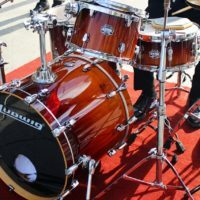 We have seen various kinds of products and techniques that can volume down a drum set. 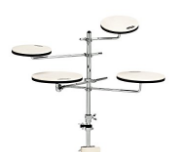 On the other side, you can find products like drum practice pads. These are an essential item to learn how to play drums. However, drummers also really need something that feels and sounds like a real drum kit. If you don’t want to buy an Electronic Drum Set, there are still options for you to use your acoustic set as a practice option. Drum manufacturers have finally managed to create something that can satisfy both sides. These products are called low volume cymbals and silent stroke drum heads. With these products, a drummer can finally count on a real drum tone at low volume, while the rest of the family or neighbors would appreciate the fact that these products are significantly quieter than common acoustic drums. 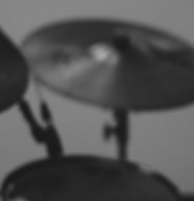 In drumming, cymbals are characterized by a high pitch and extremely long sustain. Cymbals can be a very tricky instrument to practice quietly on. After many years of development and various experiments, drum designers have finally realized that the best way to quite down cymbals is to perforate them. In most cases, such design reduces noise by about 70-80%, so you can finally practice whenever you want, have late night sessions, quiet rehearsals, etc. Besides the perforated pattern, some manufacturers tried to muffle cymbals in other ways, like special coatings. However, perforated cymbals turned out to be the best alternative, because they keep the original sound, dynamics, and overall tonal characteristics. Dimensions, shape and mounting system are completely the same as on standard cymbals, so you can get the exact feel while playing them. On today’s market, you can find various kinds of products. Usually, manufacturers offer sets of cymbals that include hi-hat, crash and crash ride cymbals. Of course, that doesn’t mean that you can’t find single pieces, like a large 20” ride cymbal or 10” splash, for example. Standard drum heads are also very difficult to play quietly on. Even using hot-rods still produces quite a significant amount of volume. All these muffling methods generally work well. However, the problem with most of them is the degradation of the drum sound. On the other side, silent stroke drum heads are all about tone quality. These heads are made of a special kind of a plastic mesh, which provides a great low-volume sound and overall feel. When it comes to muffling, these heads are so quiet that they are much less likely to cause annoyance or disturb others. These drum heads come in various dimensions, so you can use them for all kinds of toms and snares. Biggest diameters go up to 24”, so muffling a bass drum won’t be a problem at all. You can purchase complete kits that include various kinds of heads of different sizes, or go for each piece separately if you play on some uncommon set. The Zildjian Quiet Pack is one of the best and most popular packs of this kind. One of the world’s most renowned drum companies offers a kit that includes a set of three low volume cymbals – 4” HI Hat, 16” Crash & 18” Crash Ride. There are also five high quality drum heads in total (10”, 12”,14”, 16” & 22”), which can cover most common drum sets. Considering the design of these cymbals and heads, there is no reason why you couldn’t make a hybrid drum set. All these heads and cymbals work well with drum triggers. Considering the same construction and overall design, trigger mounting is equally simple. Just get a good set of triggers and quality module, which can be used for either practicing, quiet sessions, recordings, rehearsals, stage performances or any other occasion. Many drummers use muffling techniques while practicing. The most often used option is pillow trick. You simply put a pillow, blanket or something similar that is large enough to reach both heads of the bass drum. In that way, the sound gets muffled, significantly quieter. The pillow also blocks that large amount of air that would usually move through the bass drum and produce a much louder noise. The pillow trick is one of the rare muffling techniques that can actually make your drums sound better. A reasonably sized pillow that is well placed in your bass drum can actually make it a lot punchier. 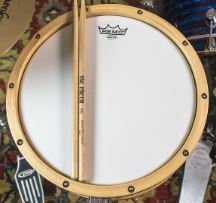 Another common way to muffle drum heads is to use mute pads. These pads are placed over complete heads (they can be used for cymbals as well) and they can deaden the sound. It is a good muting technique for basic practicing, but you won’t be able to hear much of the drum’s actual sound. For snares and toms, you can use plastic O-rings to control excessive ringing. However, these do not significantly reduce the noise volume. These will absorb some of the head’s resonance, resulting in a quieter sound for sure. You can also get drum gel packs. Place them on the toms and snare to mute drums, results are quite decent. Moon Gels are commonly used by drummers both for live performances and recording sessions in order to control the overtones of the drum heads. Some drummers use a cloth strip or duct tape to muffle the sound. The snare drum is often the noisiest element of the drum kit. Putting a cloth over the drum head can take away some of the excess volumes. However, it certainly takes away from the rebound and feeling of the snare drum. So that’s our verdict on low volume cymbals and silent stroke drum heads. If you are unhappy with your current attempts at muffling your drum set, then these might be the best option for you. I think almost every drummer should get a set of these, particularly if you are planning to use your drum set as a practice option for long periods of time.